I know what you’re thinking. 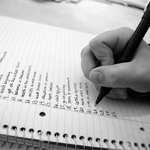 The list is a mainstay of blog writing. You see it on nearly every blog in existence. Heck, some blogs ONLY use the list format. And to demonstrate how firmly entrenched the list formatted blog entry is in the blogosphere, I myself was about to title this post “5 Reasons Why Bloggers Should Ditch the List Format” before I realized the irony. But if lists are so popular, why would any blogger in their right minds advise against it? Well for starters, there are millions upon millions of blogs out there, each vying for their own plot of readers. In fact, a Blog Herald article noted recently that the task of counting how many blogs are out there is virtually impossible. Considering these vast numbers of blogs, bloggers who really want to stand out will have to learn to distinguish themselves in whatever way possible. Formatting your articles differently is one simple way to do just that. Another reason to give up the list, I’ve found, is that the same format tends to produce the same style and content. In my own experience as a freelance blog writer, I’ve noticed that when I write list posts, I use the same phrases, sentence structures, and I simply get bored writing more easily. If you find that lately your blog has been lacking creative energy, consider experimenting with your format. Chucking the list doesn’t mean you have to give up subheads and such, it just means you have to think less rigidly, which will hopefully open more room for creative space. From my own personal experience, when I started making my blog writing more about my personal experiences through anecdotes and less about giving advice through lists, I realized that I became more engaged in what I was writing. And this engagement became infectious, as evidenced by the greater amount of comments I received on my non-list formatted blog entries. Even if your particular blog niche is especially suited to writing lists, change it up a bit every once in awhile. If anything, it’ll make the process more fun. I agree that a mix of posts works best. Some topics lend themselves to lists while others work much better as a friendly chat among friends which includes story telling. I do find that too many list posts makes a blog sound like a class room instead of a conversation but people respond much better to conversation than they do to lectures. If you are good at keeping your blog up-to-date you should think about Creativity as your first choice and Content next. When you want to be creative you should think ahead of your readers and guess what they would like to read next? This kind of thinking will develop awesome thoughts to your next post. Thanks for the idea! About the formatting, I never thought. I thought that attract the interest of the article can only be a good picture. Interesting tip. True… we just sometimes have to unearth innate creativity in us. Let us not limit ourselves to the “usual”. Most people (me included) like to read other people’s personal stories. I don’t think that a blog should be all about that, though. I think a mix would be good. I do think it is important to stand out from the rest as there are so many blogs out there now. If you can find a way to do something in a different way to everyone around you then you should be able get ahead of them. From my own personal experience, when I started making my blog writing more about my personal experiences through anecdotes and less about giving advice through lists, I realized that I became more engaged in what I was writing.